I watch the FA Cup final out of habit more than anything else but I'm sure glad I dragged myself out of bed and to the pub this morning because it was an absolutely great game. It had everything with the pitch looking like a hospital ward in extra time only adding to the wonderful drama. As always it was a shame the game had to be decided by penalties but the players that stepped up to take them in Liverpool shirts compared to those in West Ham showed the difference in quality nonetheless the underdogs more than played their part in one of the best finals for many years with Gabbidon, Ashton and Reo-Coker all proving that there are many players who can make the step up from Championship to Premiership. It was just a shame that Shaun Newton didn't get a place on the bench - after all he would have been good for a penalty! Afterwards I couldn't help feel that Charlton would never have been so adventurous in their play and a UEFA Cup place is fully deserved by an obviously intelligent manager in Alan Pardew. The much vilified West Ham board also take credit for sticking with him when it would have been easier to sack him and appease their critics. 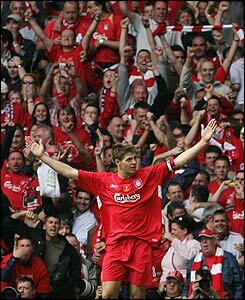 Like Henry and Rooney I can watch Steven Gerrard all day, you just knew with the time ticking down he would have one last say. What a player, unlike Peter Crouch, whose manager had no hesitance in pulling him off a good hour before much better players decided the game.